Timeless styling, beautiful furnishings and sumptuous seating feature throughout to create an elegant and comfortable atmosphere. 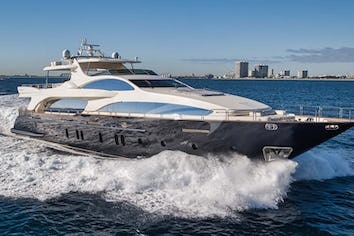 LEGENDARY's impressive leisure and entertainment facilities make her the ideal charter yacht for socializing and entertaining with family and friends. Her interior layout sleeps up to 8 guests in 4 double staterooms, perfect fore couples! . 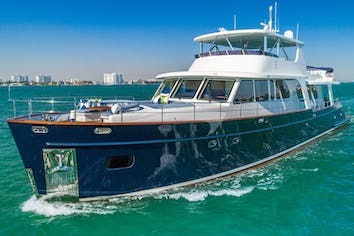 The flybridge has a fiberglass hardtop with retractable sun roof and 62" plasma TV which is recessed in the overhead just above the helm station. There is a 2 1/2' extension on the transom which houses a fully hydraulic set of stairs and underwater platform for swimming and personal watercraft access. Underwater lights located on the swim platform will provide hours of evening underwater viewing. Engines 2 X DETROIT DIESEL MTU 16V2000 M72 SERIES DDEC. Clayton was destined for a nautical journey, he was born in Newport News, Va and raised in the Florida Keys. As a minor Clay was introduced to a variety of water sports including snorkeling, spearfishing and sailing. Before Clay joined LEGENDARY, he had been crew upon traditional sailing schooners in New England and joined us mid-2017 as our 1st mate and water sports guru. Clay enjoys leading the water activities whether its fishing, Jet skiing, snorkeling or excursions by tender throughout the Bahamian waters. Pasta de la Casa: Veal and pork, grounded and sautéed with onion, garlic, red pepper flakes, cream and parmesan cheese. "I’m afraid if I get started on this trip I will never stop! From the momentwent met Captain Murph until the day we waved good bye. I can say there wasnever a moment of disappointment. Every member of the crew wasprofessional, engaged and anticipated our every need. Therooms were spotless and the food was consistently delicious! The flexibilityof being able to choose our own way and spend as much time as we liked in anyarea was exhilarating. We have been boating in the Bahamas forover 50 years on all types of yachts. We must say that we’ve never had abetter yachting experience than the ten days my wife and I spent on theLegendary this August. 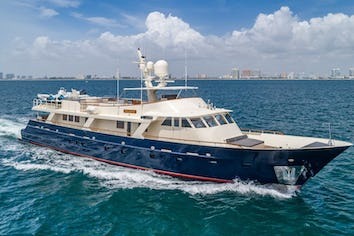 Yacht – we found her to be very stableand an easy ride even when the seas exceeded 5 feet on the crossing of the GulfStream. She is beautifully and newly re-decorated and equipped living upin every way to her luxury super-yacht status. In addition, she has severalfeatures which makes her unique and greatly enhanced our trip: (i) a foldingswim platform over15’ wide with steps into the water providing both a perfecton/off for swimming and a safe and easy access to the yacht’s tender –especially good as my wife had broken her arm a few weeks before the trip andwas in a sling; and (ii) a fun movie theater on the top deck which the crewmade into a gourmet dinner theater under clear and calm skies for us. Crew – it is unusual to find a crew socompetent, and which works so well together. The Chef was superb turningout breakfast, lunch and dinner each day which would make a Five Starrestaurant proud. The steward was quick witho ur drink and even quicker inmaking sure our stateroom was always in shows condition. She also had areal talent for making the dinner table lookalikes it was set for royalty andto dress the table for special occasions. The Mates were always helpfuland kept the vessel in Bristol condition at all times. In short, a first class time which Iwould rate A+, and we’ll look forward to another trip on the Legendary. I wanted to reach out to you and share my experience aboard the Legendary last month. My husband and I spent 4 days on the boat and couldn’t have been more pleased. Thechef is extremely talented and the food was amazing. She asked us eachmorning what meals we would like to have on board and if there was something inparticular we were looking for. The stew was very knowledgeable withproper service and quick to ask if there was something she could provideall while giving us privacy and space to relax. The captain was aperfect gentlemen. Wewould definitely recommend this boat.